Lately, VMUG has become no stranger to controversy after dust-ups with rowdy vendors like Nutanix, and a website launch that was lackluster and fairly disruptive amongst a messy and fast-paced split from SmithBucklin (the original VMUG HQ outsourcer). Now they are dealing with a self-made mess after the announcement that VMUG is joining the Dell Technologies User Community (DTUC) community. There have also been ongoing issues that generally stay at a low, but steady boil, like the corporatization of the organization and the ridiculous “election” process for board members that only gives us members a simple yes/no vote on a full slate of officers. To anyone paying attention, VMUG is seriously hurting right now, and not only because of its own actions. I’ve been a member of the larger VMware community from the very beginning. I’ve attended every US VMworld (going back to 2004), and all but one of the US Partner Exchange events. I helped start one of the early VMUGs in Omaha in 2006, and led it until 2008. I’ve been a consistent and active member ever since, including a steering committee member the last year or so. I attended one of the first meetings that would later become known as “UserCon” (the Kansas City based Midwest Regional VMUG). I’ve been to and/or spoken at many other VMUGs (both local chapter and UserCon) in Iowa, Indy, Connecticut, Minneapolis, Wisconsin, Dallas, and Houston, among others. I’ve even worked with VMUG as a VMunderground sponsor. I love talking to other VMUG members, and have had many, many discussions with different VMUG leaders, board members, and HQ employees on a wide range of topics. So, needless to say, I’m very vested in the “vCommunity” and continue to support it any way I can (including VMunderground). We were right to worry about the independence of VMware from Dell. EMC was already clearly poking holes through the firewall they established to allow VMware to act independently, and Dell clearly is already continuing/accelerating this. We were right to question the independence of VMUG from VMware. To me, this is obvious due to the transitive property of the situation. Dell now owns VMware and therefore has special privileges with VMUG, which throws their independence into serious concern. The ineptitude of connecting with the community, particularly the people who really make the organization work — the local chapter leaders. This announcement was botched on pretty much every level. I attribute this to the fact that VMUG HQ must be more concerned with the upstream relationships (VMware/Dell) than they are with the downstream relationships (leaders and users). There was no pre-announcement communication to the leaders, which shows a clear disregard for their opinions and a severe breach of trust. The announcement was a strong “this is the greatest thing since sliced bread” announcement, but the fact that they spent the next week explaining the decision away and trying to calm the leaders and members shows it wasn’t completely thought out. I’ve heard that it was held back so it could be a big-splash announcement at DellEMC World, but that’s no reason not to clue in the leaders. They either didn’t believe the leaders would be receptive or don’t understand the power of having a devoted fan base ready to amplify your good news. To be fair, every organization has botched announcements, but this could’ve been completely or largely avoided by cluing in the leaders beforehand. The nature of the arrangement between VMUG and DTUC is simply a landing page that links to all the community sites that are based around technologies in Dell’s portfolio. I hear that there was no procedural change to VMUG business, so the board of directors didn’t even need to vote on it. If this is the case, then the announcement was WAY over promoting the relationship, much to VMUG’s own detriment. However, I’ve seen nothing to suggest this isn’t special treatment for Dell because they now own the majority shares of VMware. There are plenty of other companies out there who have strong (possibly stronger) business relationships with VMware, who could benefit from a tight User Group relationship. If it’s really ONLY about awareness to other communities (which is great), why not do the same with HPE, NetApp, Lenovo, AWS, or Cisco communities? Why suggest that this will allow co-located VMware and Dell User Group meetings? What about a relationship with VTUG? What about connecting the VMUG community into the Microsoft and Citrix communities since both of these companies have lots of customers running their products on VMware? Why not work with all these communities to create a truly independent user community to help broker all users to all communities that are relevant to them? If VMUG is truly independent from VMware and VMware is truly independent of Dell, and their intention was to best serve the individual members, why would any of these be considered crazy? Now, don’t get me wrong, I don’t think the concept of including VMUG in the DTUC is inherently wrong, it’s actually a great idea (for Dell) to allow the Dell communities to ride the coattails of VMUG’s success. As much as all of us converged and hyperconverged companies like to talk about eliminating other vendors from the data center, there’s always going to be a mix of technologies and vendors. Helping users connect to other relevant communities is a great goal, but that promise falls completely flat if VMUG only does it with Dell communities, because it clearly shows favoritism. Even if this whole situation was started by Dell (which I have indications it did), VMUG should be actively reaching out to other vendors to do similar relationships, if only to show they’re not giving Dell special treatment. If this move is so exciting and beneficial to the “advancement and development of new and existing communities that support our members and their organization’s needs,” they why wouldn’t VMUG be equally eager to have similar relationships with all the other vendors listed above? Of course, this assumes that there is true independence from VMware and Dell, and VMUG is going to work in favor of members even when it might partially conflict with VMware and Dell’s interests. I see this announcement as one of the worst PR moves in recent memory (all government machinations aside). I mean, seriously, what did VMUG HQ expect? They announced that the new majority owner of VMware, who people were already worried about mucking around with our favorite vendor, was a new umbrella over VMUG. And it was done without input or even warning to those leaders who keep the community together for them. 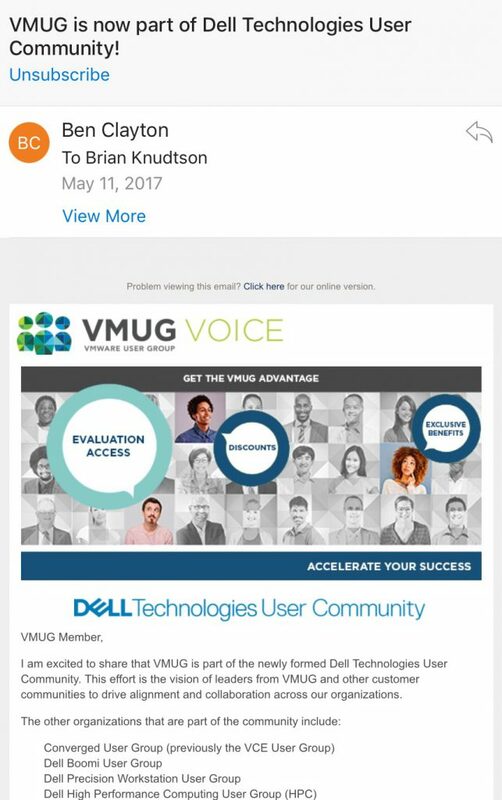 And it was literally advertised as “VMUG is now a part of Dell Technologies User Community,” indicating that it was an ownership change! I do have to admit I feel most sorry for Ben Clayton in all of this. Many of the mistakes that VMUG have made happened or were started prior to his tenure as VMUG President. I’ve known Ben personally for many years, and I know he understands and wants to fix many of the problems that VMUG has. One advantage of all this: he now has clear mandates and the heat to make real change. He has some serious challenges to deal with, though. I’ve heard long and constantly that VMUG has become too money-driven. There’s a lot of duality with the introduction of VMUG HQ. The explosion in UserCon events probably wouldn’t have happened without a more formal structure to VMUG. UserCons are mostly run by VMUG HQ, which is good for some of the events. On the other hand, some of the bigger ones wish that VMUG HQ would get out of their way. Outside the UserCons, most local chapter meetings are running more or less independent, though some get more help from VMUG HQ than others. Some have told me that they see the potential advantages, but they never realize these advantages in practice and definitely feel the restrictions that come down from VMUG HQ (the black listing of some vendors, for example). Overall, most of the leaders I talk to (including those running UserCons) feel that VMUG HQ is a money-making scheme that insulates VMware from the local chapters, while also giving VMware more (masked) control, and ultimately providing very little relative value back. Especially when decisions are being made with zero input from members and leaders and very little transparency is provided into the operations of the organization. All of this comes at a bad cross-roads for our community as a whole. Sponsors are spending less on events they can’t strongly tie business to. I see this through VMunderground, conversations with VMUG and other community event leaders, and from working at a vendor myself. As VMware grows and increases its portfolio, it starts to compete with previously strong partners. Also, both members and leaders are starting to focus on other technologies. Some of VMware’s products are hands-down best-in-class, but really aren’t as exciting as they used to be. Other products are interesting only because they’re owned by VMware. As AWS, Docker, and other fast growing technologies/companies gather more mindshare, sponsoring vendors (which, quite frankly, have been the monetary lifeblood of VMUG) are focusing less and less on VMware’s community. These items are conspiring to cause a lot of stress on the community and will likely cause VMUG to continue to struggle with attendance and income. This has been such an amazing community, I’m really hoping it is able to evolve and continue. VMUG have the opportunity to make this change happen internally, but if it doesn’t then the change will happen elsewhere and VMUG will be left behind. As a leader of a smaller VMUG (Gainesville VMUG) these massive changes were a surprise to me as well. I’ve only been a leader for less than 2 years and we are trying to build up consistent attendance. I have many concerns about a defacto Dell takeover of VMUG. I am left wondering why, long-term, vendors that compete with Dell would want to continue sponsoring a user group that is beholden to a competitor. While I enjoy the interaction and obviously a huge VMware fan I would stop participating if all these changes started interfering with our memberships enjoyment of these meetings. I hope that VMUG HQ will do as you say and reach out to other communities to keep the independence of the VMUGs more apparent. James, thanks for your comment. I definitely agree with your thoughts and am afraid that could be where we’re headed. VMUG is saying that it’s only a Marketing-level relationship for now. There is plenty of uncertainty if it could go further than that in the future. I know of some Dell competitors that are now pulling back, so your fears are not unsounded. I think if it was discovered that VMUG ever shared registration leads with Dell directly, that would end things for most of us pretty quick.